A field shoreline is an object, specifying global water areas where swash zone should be located. Field Shoreline helps to create swashes near the shores and applies the wetness effect on objects near the shoreline. A field shoreline object will affect water only if the FieldShoreline interaction option is enabled on the States tab of the water_global_base material. Swash zone created by using FieldShoreline object. A FieldShoreline class to create a FieldShoreline object by using C++, C# or UnigineScript API. A render_field_shoreline_resolution console command to change the resolution of the texture into which all textures set for the object are rendered. 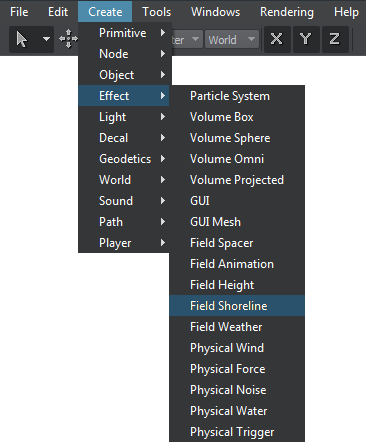 On the Menu bar, choose Create -> Effect -> Field Shoreline. Place the shoreline field in the world so that it intersects Global Water object. Make sure that the FieldShoreline interaction option is enabled for water_global_base material. 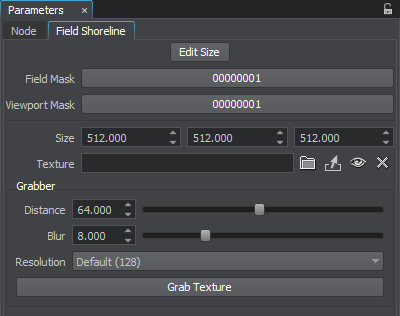 Go to the Field Shoreline tab of the Parameters window, set up necessary parameters and grab the shoreline texture. 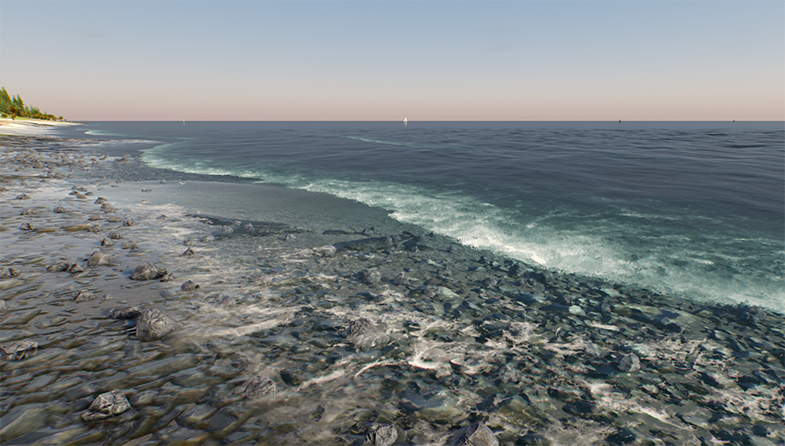 After adding a FieldShoreline object to the scene, you can't see any changes of the global water object because FieldShoreline object doesn't have any default texture. A field mask. A bit mask that specifies an area of the shoreline field to be applied to water. The shoreline field will be applied to water only if they have matching masks. A viewport mask. A bit mask for rendering the shoreline field into the current viewport. For the shoreline field to be rendered into the viewport, its mask should match the camera viewport mask. Size of the shoreline field along the axes in units. Big sized FiledShoreline object provides less detailed swash zones. Shoreline texture. Grab the texture to fill that field. Padding distance (from shore to the beginning of swash). Blur coefficient (make shoreline smoother).